Earth is a living object. And every living thing is bound to die. There are many theories regarding the origins of Earth. Scientists are also trying to find an answer to another important question: How much longer will the planet be fit to live? Some scientists believe that the fate of Earth has been predetermined i.e. life on Earth will be burned out and destroyed even if each member of the human race should join the “green movement” one of these days. A recent piece of scientific news came in as a nice surprise for the Russian public. Experts in geodynamics gathered irrefutable evidence about the ongoing movement of the Crimea, which is said to be drifting slowly but surely toward Russia at a speed of 2-3 cm per year. However, those who show lots of enthusiasm at the news may as well wake up in a house on fire. The point is that Earth’s tectonic and geologic processes portend the end of the planet and its subsequent transformation into a star. By and large, the prospects do not look so bright for the species. Contrary to a popular misconception about Earth, the planet is going through constant changes. The radius of Earth expands by one mm per year; the water level in the ocean is on the increase. Lake Baikal grows wider by two cm every year. The volume of Earth is increasing at an annual rate of 515 cubic kilometers. The rate seems to defy imagination. In other words, the planet is growing bigger at an appalling pace. It is getting increasingly harder for Earth to revolve around the Sun. According to estimates by Prof. Sergei Novikov, the day grows longer by 0.0023 seconds every one hundred years. As a result, the distance between Earth and Sun grows by 22.6 m per year. The estimates are based on data provided by high-precision lasers used for monitoring space satellites. A reconstruction indicates that Earth was revolving like crazy some 3 billion years ago. One day comprised 19 hours back then; it is expected to equal 25 hours in 100 million years. That is excellent news for those of our descendents who would like to have a lie-in. By the way, the problem concerning the changes in the shape of Earth and the speed of its revolutions has an important practical purpose. The above characteristics are essential for designing orbits of space satellites and maintaining accuracy of electromagnetic signals. There are two reasons behind the continued increase in Earth’s size. The active tectonic processes are one of the reasons. The eruption of Pinatubo volcano in the 1990s had a greater impact on climate than all industrial emissions combined. A huge amount of interstellar dust falling onto Earth is the second factor. An estimated one billion tons of interstellar dust fall out every year. According to one of the theories, the tectonic processes and enlargement of Earth caused the splitting of the continents and proportional increase of gravitational forces. The same theory maintains that the dinosaurs died out in the process. However, Earth is capable of changing its status. The quantity will become the quality. 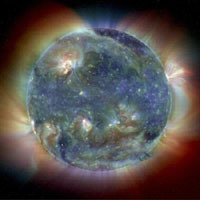 Thermonuclear processes similar to those occurring in stars will go under way in the depths of Earth in billions years. A chain reaction will begin in the bowels of the planet once the mass exceeds a certain critical level. The effects of colossal pressure will make Earth look like an H-bomb; it will heat up to temperatures observed in the Sun. Scientists do not know yet whether the changes will create conditions suitable for the appearance of life forms on the Moon or Venus.